Looking for an eLearning authoring tool that can keep your data safe, secure, and easily accessible in the Cloud? If so, Trivantis Lectora Online may be the all-in-one solution for you Learning and Development needs. In this article, I’ll review Trivantis Lectora Online, so that you can determine if it’s a good match for your organization avoiding all the costly trial and error. Lectora Online is Trivantis’ offering to the world of cloud-based course authoring. Those who are familiar with their desktop tool will find that this online version offers the same features and flexibility, but with the added bonus of anytime, anywhere access and collaboration. In this review, I’ll highlight the most notable features of Trivantis Lectora Online, then delve into the pricing, ease of use, and support services that you may want to factor into your decision-making process. Trivantis Lectora Online is in the Cloud, which means that there’s no software installation. You simply sign up and access the user interface in your web browser. This can be a big time-saver, especially when compared to an installed authoring solution that requires a lengthy setup process. Whether you’re working with a team on a regular basis or occasionally consulting with other eLearning pros, Lectora Online has collaboration tools that allow you to work remotely with eLearning content creators and contributors. You can even share online content, feedback, and keep track of your progress in the Cloud. Another perk of working in the Cloud is constant access to your online learning materials and eLearning course layout. Lectora Online also has the ability to import and export data from and to the desktop version. Last, but not least, it’s compatible with Mac, Windows, and even Linux operating systems. If you’re on-the-go, Trivantis Lectora Online goes with you. You won’t ever have to worry about crashed hard drives, corrupted files, or missing documents again. Lectora Online stores all of your information in the Cloud, then backs it up on a safe and secure server. If needed, you can roll-back to a previous version in just a few clicks, or even compare versions to decide what to keep and what to discard. Adding GoAnimate eLearning videos and converting MP3 or MP4 files to make them mobile-friendly is easy with Trivantis Lectora Online. Lectora Online also includes HTML5 media support, which means you won’t have to worry about mobile or browser compatibility issues, as is sometimes the case with Flash-based online courses. You can create an online course that every member of your audience can benefit from, even those who are using their smartphones and tablets; this is a major plus in today’s mobile-centric world. All of the eLearning experiences you create using Lectora Online can easily be published to Web, Web-based AICC, or SCORM-conformant LMS, including CourseMill LMS and CourseMill Wave. If you create an eLearning course that includes eLearning assessments, the system will automatically transfer the data to the learning management system, so that you can quickly and conveniently keep track of learner progress. Trivantis Lectora Online packs an abundance of features, but it comes at one of the lowest price points. 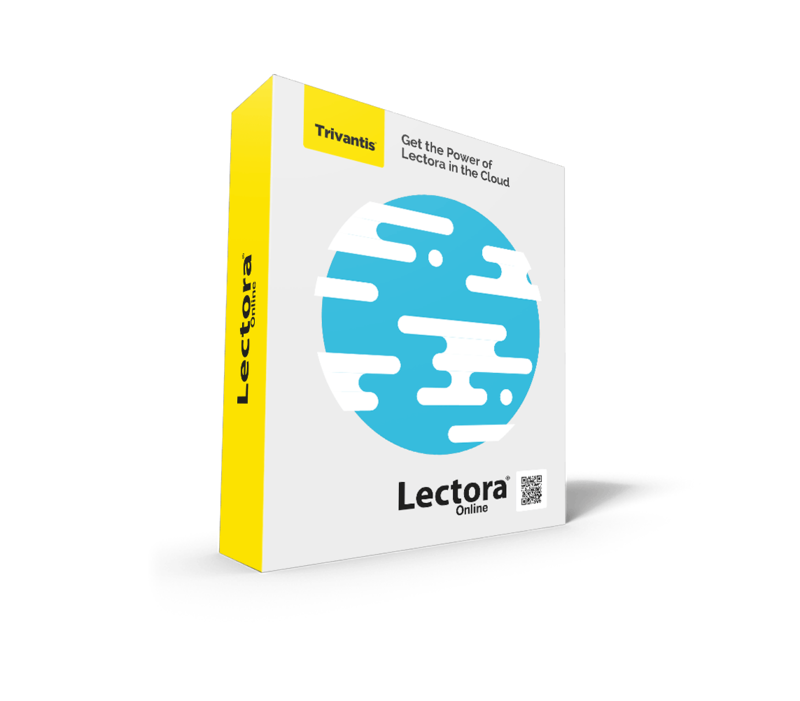 You can subscribe for Lectora Online Cloud-based authoring tool for $159 per month. Trivantis also offers a 30-day free trial, which gives you the opportunity to try before you buy. There’s no need to purchase any software up front, which usually requires a sizable investment. If you are already using any Lectora desktop version, then there won’t be any learning curve whatsoever. The interface is very similar and you’ll find most of the same features and functions. If you aren’t familiar with Lectora’s desktop edition, but have some experience with authoring tools for eLearning, then you should be able to master the tool within a matter of days. Although Lectora Online doesn’t offer as many pre-made interactions to choose from as the desktop version, it comes with almost 75 themes that include all of the background images and navigation buttons you’ll need to create your own, offering your audience a great looking online course. Trivantis Lectora Online also has a variety of pre-set templates that make it relatively easy to create eLearning materials, including pre-defined menus, online course sections, and pages. Best of all, you can access the interface via your browser, which eliminates the need for an on-site demonstration or lengthy orientation process that is usually the case with installed solutions. Trivantis is known for their great support services and user community. If you have any issues you can call them by using their toll free number during business hours or fill out their online contact form to speak with a member of their support team. They also have an online forum and resource section on their site that features a variety of “how-to” articles and FAQs. Being able to chat with other Lectora Online users is a major advantage, as it allows you to get the most benefit from the authoring tool by quickly resolving common problems. All of these support services are included in your monthly subscription fee. So, you won’t have to pay extra to get the help you need. Lectora Online boasts a user-friendly drag and drop interface, a multitude of design features, and productivity-boosting collaboration tools. You can develop your online courses without having to store any data on your local servers, which means that you can share learning resources with other members of your team on a variety of different devices. Also, the fact that they offer a monthly subscription fee, rather than a larger one-time install fee, makes it ideal for eLearning professionals working with a smaller budget. If you’re looking for a cloud-based course authoring tool that offers the content development, assessment and deployment power of Lectora desktop software then, Trivantis Lectora Online is definitely worth the monthly investment. Want know if your eLearning authoring tool offers you the features and functionality that you truly need? Read the article Evaluate Your eLearning Authoring Tool: 6 Questions You Need To Answer to discover some tips and tricks on how to choose the eLearning authoring tool that gives you the most value for your money, and helps you to create meaningful eLearning experiences by balancing budget with versatility.